The Indian Wells Masters 2019 has come to an end with a grueling contest between the master and the prince. Surprisingly however, the prince came storming back from a set down and eventually beat the master with some exceptional shot-making. Dominic Thiem has stunned Roger Federer 3-6, 6-3, 7-5 in a match that lasted a little over two hours. This was the second successive finals defeat for Federer in Indian Wells, after his loss to Juan Martin del Potro last year. 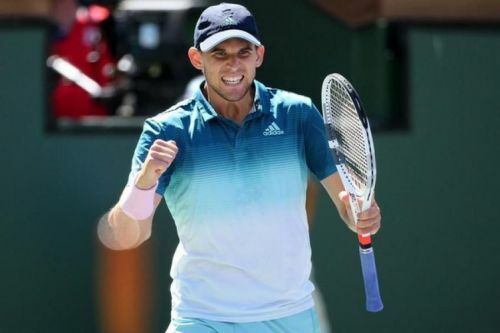 2019 Indian wells was Thiem's first ATP Masters 1000 title. In the first set, Federer was at his usual game of being aggressive and quick, which fetched him a break early for a 4-1 lead. But he was unable to maintain his ascendancy as Thiem broke back and took the score to 3-4. Federer rallied just in time, breaking Thiem's serve again and eventually taking the set 6-3. But Thiem was not done yet. He was resilient and explosive, looking fully committed to give it his all before down to the legend - and the attitude worked wonders for him. In the second set, even though Federer's aggression remained the same, Thiem was more effective in hitting his ground-strokes out of reach of the Swiss. Even Federer's net play was successfully countered by Thiem with some deadly passing shots. Federer did most things right but Thiem was just too high on energy, gaining momentum every minute in the second set. Federer got broken once in the second set, and that made all the difference, changing the course of the match for him. In the third set, both of them held serve for 10 games, and it was Thiem who drew first blood at that point. Federer's drop shots didn't work too well for him while serving at 5-5, and that eventually cost him the match. From Federer's view point, he would be a tad bit disappointed because his inconsistency in holding serve, despite serving well, proved costly for him. He would have been hoping to add to his tally of 100 titles, but that wasn't to be today. As far as Thiem is concerned, he has now won his first ATP Masters 1000, with the occasion being extra special considering the opponent was Federer. This win will give him confidence for the upcoming Miami Open that is going to roll out from Monday.